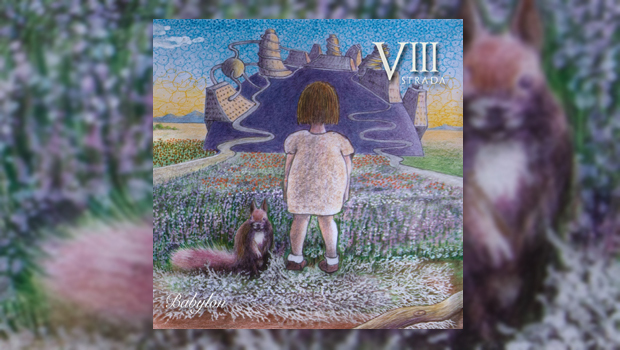 VIII Strada are a Milan band led by pianist and keyboard maestro Silvano Negrinelli, who wrote all the music and words to Babylon, the group’s second album and a concept work telling the story of a couple describing their “conflicts, confrontations, passions, and shared projects”. Also “at the centre of this story is the symbol of the concept: Babylon describes the discomfort and loneliness” of someone struggling with adjusting to the wider world, or at least that’s as much as I can glean from Google Translate, as the lovingly designed CD case and booklet are entirely in Italian. Heavy stuff, then, and the music is suitably dramatic, bordering on bombastic, and instantly recognisable as the grandiose symphonic rock that so much of Rock Progressivo Italiano uses as a base. Prog Archives bafflingly file the band under “Progressive Metal”, thankfully they are anything but! The album ramps up the intensity as it goes, and by the time we get to Slow all instrumental stops are pulled out to produce some really good quality cinematic prog of the highest order. The instrumentation on the record goes through many twists and turns, and lengthy solos are sensibly eschewed for passages full of instrumental flourishes, with the piano and guitar in particular often taking centre stage. Admittedly not my usual fare, it is hard not to like Babylon as it charges to its conclusion in the manner of the real force of nature that it is. VIII Strada have made a winner!